Understanding newborn brain damage: What is it, what are the causes, & how is neonatal brain injury treated? Brain injuries affect about three in 1000 term babies in the U.S. every year, and approximately 50 percent or more neonatal brain injuries are caused by a lack of oxygen in the baby’s brain, called birth asphyxia. Often, birth asphyxia is caused by mismanaged conditions that occur during or near the time of delivery. Brain injury in a baby, often referred to as neonatal encephalopathy (NE), can sometimes be treated, but the medical team must quickly diagnose the brain injury and give treatment within hours of delivery. In this article, we discuss the signs and symptoms of neonatal brain damage, how it is diagnosed, the causes of and treatments for brain injury, how brain damage in a baby can be prevented, and what the long-term outlook may be for a child with brain damage and resultant conditions, such as cerebral palsy (CP), developmental delays and seizure disorders. What are the Signs and Symptoms of Brain Injury in a Baby? Low apgar scores for more than 5 minutes. How is Infant Brain Damage Diagnosed? Neonatal encephalopathy – especially hypoxic ischemic encephalopathy – must be diagnosed within the first few hours of life so critical treatments and therapies can be given. In the first few hours, doctors look for signs and symptoms of encephalopathy. Later, head imaging is used for a more definitive diagnosis. Some forms of newborn brain damage can be seen at 12 – 24 hours after birth. For example, an MRI (magnetic resonance imaging) can usually show moderate to severe forms of HIE within 12 – 24 hours of birth if the baby experienced birth asphyxia. When a premature infant has periventricular damage, the damage will usually be evident on an ultrasound when the baby is 24 hours old, and cystic changes will usually be seen after approximately one to three weeks. Of course, an MRI is best for assessing the extent of white matter damage and it can usually show brain injury by one day of age, but since brain injury evolves, brain scans need to be performed at least every few days when brain damage is suspected. Sometimes even the best radiologists miss evidence of brain damage on a scan, or the brain damage may not be evident, so scans performed every day when the baby shows signs of brain injury are not uncommon. Once the initial damage is established, however, serial scans must be performed so the medical team can assess the changing brain injury. What are the Possibilities for Treatment? Hypoxic ischemic encephalopathy must be diagnosed within 6 hours of birth if doctors think the baby experienced an oxygen depriving insult at birth (birth asphyxia). The reason a diagnosis of HIE must occur so quickly is because there is only one treatment for HIE and it must be given within 6 hours of the insult that caused the HIE. Since the diagnosis must promptly occur, doctors don’t use head imaging for a diagnosis. Instead, hospitals have a set of criteria that newborns must meet in order to qualify for HIE treatment. This criteria consist of many of the signs and symptoms discussed above. Once a baby is eligible, she is given hypothermia (brain cooling) treatment. During hypothermia treatment for HIE, the baby’s core body temperature is cooled to a few degrees below normal for 72 hours. Then the baby’s temperature is slowly brought back to normal. Hypothermia treatment is groundbreaking. It has been shown to halt almost every injurious process that starts to occur when the brain suffers an oxygen depriving insult. In addition, research shows that the treatment can prevent the baby from developing cerebral palsy, or the treatment may cause the baby to have a less severe form of CP. This is very important because babies with hypoxic ischemic encephalopathy often receive later diagnoses of cerebral palsy. Treating any type of brain injury involves supportive care designed to ensure adequate blood flow to the baby’s brain and minimize brain swelling and fluid build-up. If the baby has a brain bleed or hemorrhage, it must be quickly diagnosed and treated. Seizures must also be promptly treated because they can worsen existing brain injury and cause further brain damage. Sometimes seizures are difficult to recognize in a baby. Any baby suspected of having HIE or an insult to the brain should receive either continuous EEG monitoring or frequent EEG testing because HIE is the most common cause of seizures in a newborn. Permanent brain damage after a brain insult can be minimized if the medical team acts quickly with supportive care, treats underlying problems such as brain bleeds, and promptly diagnoses HIE so the baby can receive hypothermia treatment. Often, babies with brain damage need help breathing because brain injuries can cause the baby to have a depressed ventilatory drive and / or periods of apnea. To make sure the baby gets enough oxygen and gets rid of enough carbon dioxide, the baby may need the assistance of a breathing machine (ventilator). The machine may give just a little support, or sometimes full support may be needed. In addition, babies with brain injuries often experienced a difficult birth. They may have inhaled meconium or they may have been born prematurely, which means they might haverespiratory distress, thereby requiring the support of a ventilator. In order to receive a medication called surfactantto help premature lungs develop, the baby will need a breathing tube placed in her upper airway and she will be attached to a ventilator. The medical team must closely monitor babies on ventilators to make sure they do not experience overventilation injuries, such as hypocarbia (low carbon dioxide levels) or a pneumothorax (a hole in the lungs). Brain injury in a newborn can be caused by several different events that occur during or near the time of delivery. Most commonly, brain damage is caused by a lack of oxygen to the baby’s brain, or birth asphyxia. A brain injury caused by oxygen deprivation is called hypoxic ischemic encephalopathy (HIE). HIE is caused by a lack of oxygen in the baby’s blood (hypoxemia / hypoxia) or a restriction of blood flow in the baby’s brain (ischemia). Complications during labor and delivery that can cause HIE usually involve problems with the umbilical cord, placenta and uterus (womb). Brain bleeds can also occur if the doctor uses forceps or vacuum extractors to help with a vaginal delivery, or if the baby is in an abnormal position, such as a transverse lie, breech or face presentation. If doctors pay close attention to the baby’s heart rate on the fetal heart monitor, and if they follow other standards of care, especially when forceps and vacuum extractors are used, birth injuries and brain damage can be prevented. The key is to quickly deliver the baby as soon as fetal distress is evident on the heart monitor. A lack of oxygen to the baby’s brain will manifest as fetal distress on the monitor, also called a non-reassuring heart tracing. An emergency C-section is usually the fastest and safest way to deliver a baby who is in distress. .
Umbilical cord problems, such as a prolapsed umbilical cord, the cord being wrapped around the baby’s neck (nuchal cord), a short umbilical cord, and the cord being in a true knot. The umbilical cord vein is the final pathway of oxygen-rich blood traveling to the baby from the mother. Problems with the cord can cause the baby to be partially or completely cut off from her supply of oxygen-rich blood. Placental abruption. This is when the placenta tears away from the uterus (womb). Oxygen-rich blood traveling from the mother to the baby moves through vessels in the womb and placenta and then into the umbilical cord to be transported to the baby’s circulatory system. Problems with the uterus or placenta can significantly decrease the amount of blood traveling to the baby from the mother. In some cases, such as when there is a complete placental abruption, the baby may not be able to receive any oxygen-rich blood from the mother. Uterine rupture. This occurs when there is a tear through all the layers of the womb. A ruptured uterus can cause severe hemorrhaging in the mother, and the baby may even spill into the mother’s abdomen. The hemorrhaging can cause the mother to lose so much blood that there is a decreased flow of blood to the baby, or the rupture may be at a spot that affects the blood circulation between the uterus and placenta. Vacuum extraction delivery. A vacuum extractor is a small cup that is placed on the baby’s head so the doctor can apply gentle traction to help move the baby out of the birth canal. This is a risky device and specific criteria must be met before a doctor uses it. The pressure of the suction cup can cause a type of bleed called a subgaleal hemorrhage. This occurs when the vacuum ruptures a vein and then the vein bleeds into the space between the scalp and the skull. This can cause severe oxygen deprivation. If the bleed is not properly managed, almost half of the baby’s blood volume can end up in the subgaleal space. A vacuum extractor can also cause intracranial hemorrhages, clots, strokes and skull and spinal cord trauma. Forceps delivery. Forceps look like salad tongs and are applied to each side of the baby’s head. Forceps must be precisely placed, and it is also critical that the doctor not apply too much force. Forceps are not commonly used, so many doctors lack skill in using them. Forceps can cause trauma to the skull and spinal cord, as well as brain bleeds, clots and hemorrhages. Infection. An infection in the mother that travels to the baby at birth can cause injury to cells in the baby’s brain, thereby placing the baby at risk of having a brain bleed. Infections can also cause problems with the baby’s blood flow, leading to a decreased flow of blood in the brain. These dangerous infections include chorioamnionitis, Group B strep (GBS), herpes simplex virus (HSV), Staphylococcus (staph) infections, and E coli. Sepsis is an infection in the baby’s blood stream often caused by GBS and chorioamnionitis, and it can cause meningitis, which is infection of the brain / central nervous system. Oligohydramnios. This is a condition characterized by low amniotic fluid. Oligohydramnios puts the baby at a significant risk of having a prolapsed or compressed umbilical cord. Oligohydramnios can also lead to meconium aspiration, which is when the baby inhales a mixture of amniotic fluid and stool into her lungs. This can cause respiratory distress and oxygenation problems. Premature rupture of the membranes (PROM) / premature birth. PROM occurs when the water breaks before the mother goes into labor. PROM can cause umbilical cord compression, premature birth and being born before the lungs are fully developed, which can cause a lack of oxygen to the baby’s brain. PROM also increases the risk of the baby getting an infection, which can lead to sepsis and meningitis. Prolonged and arrested labor. Contractions during labor are traumatic for the baby, and when labor is prolonged, there can be a lack of oxygen to the baby’s brain that gets progressively worse, especially if Pitocin or Cytotec are used. Placenta previa. This is when the placenta grows close to the opening of the uterus, which can partially or completely block the mother’s cervix, which is the opening to the birth canal. If the placenta remains close to or completely covers the cervix later in pregnancy, delivery by C-section is generally required because cervical opening and uterine activity during vaginal delivery can cause severe bleeding in the mother and even the baby. Anesthesia mistakes can cause blood pressure problems and a hypotensive crisis in the mother. When a mother’s blood pressure drops too low, there will be a decreased supply of oxygen-rich blood going to the baby. Fetal stroke. This is when blood vessels in the brain become blocked or restricted. Forceps and vacuum extractors can cause the baby to have a stroke, which can cause severe oxygen deprivation. HIE and stroke often occur together. Abnormal presentations. When a baby is not in the normal, head first position at the time of delivery, she is at risk of suffering head trauma, brain bleeds and umbilical cord problems if the doctor attempts vaginal delivery. Breech presentation, transverse lie position and face presentation are some of the abnormal positions that increase a baby’s risk of suffering bleeds and cord problems. Research shows that a C-section delivery is the safest way to deliver a baby in breech presentation. Preeclampsia / eclampsia. This is when the mother has high blood pressure diagnosed during pregnancy. When this occurs, there can be decreased flow of blood to the baby. There are a number of ways high blood pressure can cause this. One way is that the high blood pressure and factors associated with it cause damage to or constriction of the vessels in the placenta. Preeclampsia also increases the risk of placental abruption. In addition, preeclampsia, or any long term pregnancy condition that can cause a baby to be deprived of oxygen, predisposes a baby to hypoxia during the stresses of labor. Uteroplacental insufficiency / placental insufficiency. Blood is brought to (and returned from) the unborn baby through the placenta. The placenta allows for nutrients to be transported to the baby, and it is also where gas exchange takes place. Carbon dioxide is removed from the baby’s blood here, and the baby gets oxygen from the mother through the placenta. When there is placental insufficiency, there is a lack of adequate blood flow to the baby, which can cause the baby to be deprived of nutrients and oxygen. When this occurs, the baby’s brain can suffer permanent damage. Conditions associated with placental insufficiency include oligohydramnios and preeclampsia. Placental insufficiency is the most frequent cause of intrauterine growth restriction (IUGR), whereby the baby is small for gestational age. As discussed earlier, when a baby is experiencing oxygen deprivation, a non-reassuring heart tracing will appear on the fetal heart monitor. he baby must then be promptly delivered by C-section to get her out of the oxygen depriving conditions. Labor and delivery units must have the ability to perform a C-section delivery right there, or the ability to get the mother to an area for a C-section delivery within a couple of minutes. Most babies are born healthy and do not require emergency plans of action during delivery. But this does not mean the hospital can take chances by being short staffed or not having proper C-section equipment in the labor and delivery unit. Babies can only be directly helped when they are out of the womb. Watching the fetal heart monitor for signs of distress and delivering a baby by emergency C-section are relatively simple procedures that can prevent a baby from being oxygen deprived and having birth injuries that can cause lifelong problems such as cerebral palsy, HIE, seizures and intellectual disabilities. Simple mistakes, such as failure to recognize and act on fetal distress, can cause an otherwise healthy child to have severe and permanent problems. Initial birth injuries include birth asphyxia and HIE, brain bleeds, strokes, sepsis, jaundice, and neonatal hypoglycemia, with HIE being the most common. Listed below are common long-term conditions that can occur after a brain injury. Hypoxic ischemic encephalopathy (HIE). Problems with the placenta, uterus and umbilical cord, as well as brain bleeds, strokes and sepsis can cause HIE. Hypoxic ischemic encephalopathy typically consists of damage to the basal ganglia and / or the watershed regions of the brain. The condition often leads to the child having seizures and a later diagnosis of cerebral palsy. Some children with HIE do not receive a cerebral palsy diagnosis, but may have lifelong learning problems, intellectual impairments or motor disorders. Cerebral palsy. Cerebral palsy is caused by injury to the motor control centers of the brain. When a child has CP, it affects her movement, posture, balance and coordination. Cerebral palsy can be mild, moderate or severe, affecting only one or two limbs in some children, but causing other children to be relegated to a wheelchair. Spastic cerebral palsy is by far the most common type, affecting 70 to 90 percent of all children who have CP.Children with spastic CP struggle with movement because there is improper communication between the brain and muscles. Normally, muscles coordinate in pairs, which means that when one muscle group tightens, the other group relaxes. In spastic CP, muscles that are supposed to coordinate in pairs actually become active at the same time, which blocks coordinated movement. Since cerebral palsy can affect so many different muscles, children with CP may have problems with oral-facial muscles, making it difficult to eat or drink, and they may also have problems controlling their bladder and other bodily functions. Seizure disorders / epilepsy. HIE is the most common cause of seizures in a newborn, but many different types of brain injuries can cause seizures. Brain injury is associated with a decrease in energy production in the brain, which causes excessive excitation of brain impulses, leading to seizures. Seizures occur when there is uncontrolled electrical activity in the brain, causing altered consciousness and convulsions. HIE can cause the baby’s seizures, the baby may have seizures due to another reason, or the baby may be experiencing seizures due to multiple reasons, such as HIE and an infection. The underlying cause of the seizure activity must be treated, if possible, since seizures can worsen brain damage. Seizures can be treated with anti-epileptic medication, but this will usually not be effective in controlling seizure activity if the underlying cause of the seizures is not treated. Some underlying causes of seizures include neonatal hypoglycemia, meningitis, herpes encephalitis, metabolic problems and other conditions that cause brain disturbances. If HIE is promptly treated with hypothermia treatment, the HIE may be minimized enough that seizures do not occur. Approximately 1/3 of all children with cerebral palsy also have seizures and epilepsy. Motor disorders. Motor disorders are caused by damage to the motor system, often the basal ganglia. Cerebral palsy is a type of motor disorder, but children can have a motor disorder diagnosis without having a diagnosis of cerebral palsy. Motor disorders can range from the child having a lack of coordination and jerky movements (ataxia) to the child having uncontrollable, repetitive twisting movements of the affected body part (dystonia). Intellectual and developmental disabilities. Intellectual and developmental disabilities occur when a child lacks mental processing skills as a result of brain dysfunction. A child diagnosed with intellectual and developmental disabilities may have a low IQ as well as limited communication and social skills, and she may be unable to care for herself. As the child develops, she may learn at a slower pace than other children and have a limited ability to learn new things. Some indications of intellectual and developmental disabilities include learning to walk or crawl later than most children, speech problems, difficulty remembering things, and difficulty with logic or problem solving. Children with intellectual and developmental disabilities typically have it right after birth or shortly thereafter. However, the condition may not be noticeable until years later when certain developmental milestones are missed. Hydrocephalus. Hydrocephalus occurs when there is bleeding inside the brain’s ventricles that progresses to significant swelling of the ventricles. Hydrocephalus can lead to damaged blood vessels and destruction of the white matter portion of the brain. It can cause a child to have seizures, cerebral palsy, and intellectual and developmental disabilities. Sometimes children with hydrocephalus need to have a shunt in their head, even when they are in grade school. Using tubes, a shunt system redirects the flow of fluid from an area of buildup in the brain to the abdominal cavity, where it can be absorbed into the child’s circulatory system. 2.) Damage to the cells that make up most of the white matter in the brain.Typically, in PVL there is inadequate blood circulation in the white matter of the brain next to the ventricles. Peri means near, ventricular refers to the ventricles or fluid spaces of the brain, and leukomalacia is softening of the white matter of the brain. The softening occurs because brain tissue in this area has died. Since PVL results in the loss of vital areas of brain tissue, particularly motor fibers that control muscle movements, cerebral palsy (CP) usually develops in children who have PVL. Cerebral palsy caused by PVL is likely to be spastic and moderate to severe. Mild to severe intellectual disability may occur along with PVL, but some children with PVL and spastic cerebral palsy have normal intelligence. Although PVL can occur in term infants, it is more common in premature babies. If you are seeking the help of a birth brain injury lawyer, it is very important to choose a lawyer and firm that focus solely on birth injury cases. Reiter & Walsh ABC Law Centers is a national birth injury law firm that has been helping children with birth injuries for almost 3 decades. 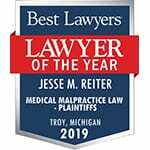 Birth injury lawyer Jesse Reiter, president of ABC Law Centers, has been focusing solely on birth injury cases for over 29 years, and most of his cases involve hypoxic ischemic encephalopathy (HIE) and cerebral palsy. Partners Jesse Reiter and Rebecca Walsh are currently recognized as being two of the best medical malpractice lawyers in America by U.S. News and World Report, which also recognized ABC Law Centers as being one of the best medical malpractice firms in the nation. The lawyers at ABC Law Centers have won numerous awards for their advocacy of children and are members of the Birth Trauma Litigation Group (BTLG) and the Michigan Association for Justice (MAJ). If your child was diagnosed with a brain injury and has birth injurues such as cerebral palsy, a seizure disorder or hypoxic ischemic encephalopathy (HIE), the award winning birth brain injury lawyers at ABC Law Centers can help. We have helped children throughout the country obtain compensation for lifelong treatment, therapy and a secure future, and we give personal attention to each child and family we represent. Our nationally recognized birth injury firm has numerous multi-million dollar verdicts and settlements that attest to our success and no fees are ever paid to our firm until we win your case. Email or call Reiter & Walsh ABC Law Centers at 888-419-2229 for a free case evaluation. Our firm’s award winning birth injury lawyers are available 24 / 7 to speak with you. In this video, Jesse and Rebecca discusses how birth asphyxia and brain damage can often be prevented by close monitoring of that baby’s heart rate and prompt C-section delivery when the baby is in distress. Executive summary: Neonatal encephalopathy and neurologic outcome, second edition. Report of the American College of Obstetricians and Gynecologists’ Task Force on Neonatal Encephalopathy. Obstet Gynecol 2014; 123:896. Wu YW, Backstrand KH, Zhao S, et al. Declining diagnosis of birth asphyxia in California: 1991-2000. Pediatrics 2004; 114:1584. Graham EM, Ruis KA, Hartman AL, et al. A systematic review of the role of intrapartum hypoxia-ischemia in the causation of neonatal encephalopathy. Am J Obstet Gynecol 2008; 199:587. Thornberg E, Thiringer K, Odeback A, Milsom I. Birth asphyxia: incidence, clinical course and outcome in a Swedish population. Acta Paediatr 1995; 84:927. Lee AC, Kozuki N, Blencowe H, et al. Intrapartum-related neonatal encephalopathy incidence and impairment at regional and global levels for 2010 with trends from 1990. Pediatr Res 2013; 74 Suppl 1:50. Chau V, Poskitt KJ, Miller SP. Advanced neuroimaging techniques for the term newborn with encephalopathy. Pediatr Neurol 2009; 40:181. Barnette AR, Horbar JD, Soll RF, et al. Neuroimaging in the evaluation of neonatal encephalopathy. Pediatrics 2014; 133:e1508. Shankaran S, Barnes PD, Hintz SR, et al. Brain injury following trial of hypothermia for neonatal hypoxic-ischaemic encephalopathy. Arch Dis Child Fetal Neonatal Ed 2012; 97:F398. Perez A, Ritter S, Brotschi B, et al. Long-term neurodevelopmental outcome with hypoxic-ischemic encephalopathy. J Pediatr 2013; 163:454. Steinman KJ, Gorno-Tempini ML, Glidden DV, et al. Neonatal watershed brain injury on magnetic resonance imaging correlates with verbal IQ at 4 years. Pediatrics 2009; 123:1025. Martinez-Biarge M, Diez-Sebastian J, Kapellou O, et al. Predicting motor outcome and death in term hypoxic-ischemic encephalopathy. Neurology 2011; 76:2055. Alderliesten T, de Vries LS, Benders MJ, et al. MR imaging and outcome of term neonates with perinatal asphyxia: value of diffusion-weighted MR imaging and ¹H MR spectroscopy. Radiology 2011; 261:235. Ferriero DM. Neonatal brain injury. N Engl J Med 2004; 351:1985. Bukowski R, Burgett AD, Gei A, et al. Impairment of fetal growth potential and neonatal encephalopathy. Am J Obstet Gynecol 2003; 188:1011. Okereafor A, Allsop J, Counsell SJ, et al. Patterns of brain injury in neonates exposed to perinatal sentinel events. Pediatrics 2008; 121:906. We handle cases across the U.S.